Insects (from Latin insectum, a calque of Greek ἔντομον [éntomon], “cut into sections”) are a class of invertebrates within the arthropod phylum that have a chitinous exoskeleton, a three-part body (head, thorax and abdomen), three pairs of jointed legs, compound eyes and one pair of antennae. They are among the most diverse groups of animals on the planet, including more than a million described species and representing more than half of all known living organisms. The number of extant species is estimated at between six and ten million, and potentially represent over 90% of the differing animal life forms on Earth. Insects may be found in nearly all environments, although only a small number of species reside in the oceans, a habitat dominated by another arthropod group, crustaceans. The life cycles of insects vary but most insects hatch from eggs. Insect growth is constrained by the inelastic exoskeleton and development involves a series of molts. The immature stages can differ from the adults in structure, habit and habitat, and can include a passive pupal stage in those groups that undergo complete metamorphosis. Insects that undergo incomplete metamorphosis lack a pupal stage and adults develop through a series of nymphal stages. The higher level relationship of the hexapoda is unclear. Fossilized insects of enormous size have been found from the Paleozoic Era, including giant dragonflies with wingspans of 55 to 70 cm (22–28 in). The most diverse insect groups appear to have coevolved with flowering plants. Adult insects typically move about by walking, flying, or sometimes swimming. 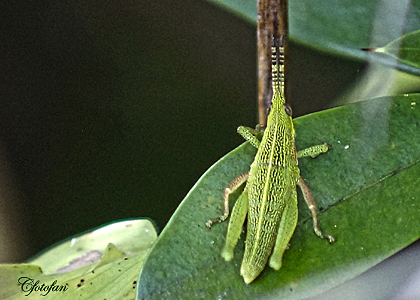 As it allows for rapid yet stable movement, many insects adopt a tripedal gait in which they walk with their legs touching the ground in alternating triangles. Insects are the only invertebrates to have evolved flight. Many insects spend at least part of their lives under water, with larval adaptations that include gills, and some adult insects are aquatic and have adaptations for swimming. Some species, such as water striders, are capable of walking on the surface of water. Insects are mostly solitary, but some, such as certain bees, ants and termites, are social and live in large, well-organized colonies. Some insects, such as earwigs, show maternal care, guarding their eggs and young. Insects can communicate with each other in a variety of ways. Male moths can sense the pheromones of female moths over great distances. Other species communicate with sounds: crickets stridulate, or rub their wings together, to attract a mate and repel other males. Lampyridae in the beetle order Coleoptera communicate with light. This entry was posted in captures, diversión, fotografías, fotos, fun, gallery, Images, imágenes, naturaleza, nature, photos, pictures and tagged butterflies, insectos, insects, mariposas, naturaleza, Nature. Bookmark the permalink.